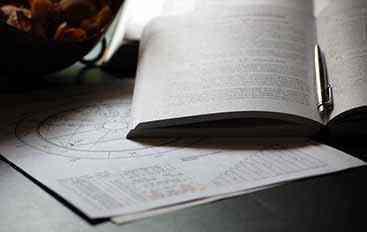 When it comes to aspects in Astrology, it is one of the most impactful characteristics during the reading of any chart. Aspects show how different planets and signs coexist on energetic level. What's more, they demonstrate the ups and downs waiting for a particular individual. 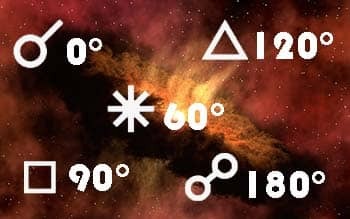 The reading of the chart is never full, until you decode the meanings of aspects. If the reading is not full, it is automatically incorrect and useless. So, take it into account as well. When you have finished reading the signs and planets in your chart, aspects should serve as a finisher for a full picture. Really, what are aspects in Astrology? To cut the long story short, aspects are the bound and relations between at least two or sometimes more planets. This bound always introduces essential changes into the interpretations of the signs and planets in a chart. If planets are in a particular aspect to each other, their interpretations should be built considering the type of this bound. Specifically, aspects are certain degrees of distance between planets also regarding Earth. Since Astrology tends to concentrate on the cooperation of the planets and Earth, it is generally believed to have a geo-centric approach to interpreting the blue. As for the planets, they orbit at different speeds in the same space region. After all these motions that happen between planets, special measuring units of angles like degrees, arc minutes / seconds occur and we use them from Earth to operate with numbers of outer space. From mathematical point of view, angle is section of the circle created between two lines that intercross at the node. Imagine our planet being in the center of the circle, then imagine a line from two planets each aiming to the Earth, so Earth is a vertex. The degree, that occurs from two lines connecting two planets form the aspect between two planets, with regards to Earth. Aspects consider not only planets, they can be derived from Moon and Sun. The aspects of the Rising sign and Midheaven are created as well. Here you can see Sun and Moon in square aspect. Their angle is 90° it can be seen from their lines that point at Earth. But astrologist use another system to find out which angle it is. It is easier to determine the aspect by one line, than to investigate through center and two lines, where it is really easy to get confused. So, in such case they use the line from Sun to Moon for a square aspect. "Major aspects" is a name to title the main and essential degrees of angles in Astrology. Among them are 0° - conjunction, 60° - sextile, 90° - square, 120°- trine, and 180° - opposition. Each aspect has an influence limited in degrees. For example, the square aspect is 90°, but the planet is 85° or 95°, it will still be assigned to square aspect. The limitation in aspect's influence in astrological knowledge is called an orb. In case of 95°, a orb will be 5°, because it is precisely how much it differs from original square aspect. There is a term - an allowable orb, it is the number of degrees by which two planets may differ from an original aspect degree. Generally, if we speak about major aspect, the allowable orb is up to 6°, while in minor aspects it is 3°, it can reach 10° if it relates to the Sun or Moon. Generally, the meaning is almost the same, but the degree of the orb defines the importance of an aspect, the smaller degree - the better. Orb degrees of 1° or less are the aspects of the highest importance. As you can see, every aspect may be viewed as a circle divided by a certain number. The full circle is 360°, in Astrology this circle is divided into 12 parts (according to Zodiac signs) 30° each. The square 90° aspect appears if planets have the same degree on the distance of three signs (90°). The sextile 60° is at the distance of two signs. 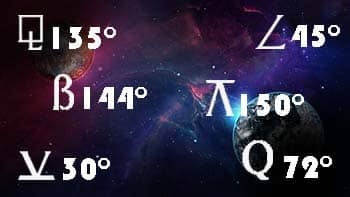 The trine is at the distance of 4 signs - 120. We can speak for hours about the motion of each and every aspect, but this article is introductory and we aim to get you to know it first simply and clearly. 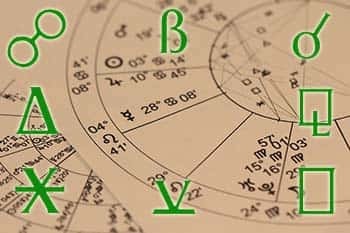 Don't forget that as you progress in astrological knowledge, you can find more and more information about the mechanisms of aspects, reading charts, ad when you are experienced enough you can even develop your own conclusions about how it works.